Brian's Story: You liked music.. In the third grade, watching your sister play piano, you decided you wanted to learn piano too. So, we enrolled you with Ms Galen, right there on Topanga, and dropped you off every Monday evening, right before dinner, for your half-hour lesson. The first evening you returned excited, telling Pia that in no time you and she could play a duet. On subsequent evenings, Miss Galen sent notes home, written right on the book, with instructions to practice more. You sat and practiced when Dad or I or Pia reminded you to do so. On your first recital, nine months later, you bowed at the audience and played your piece with confidence. You had seen such recitals for a few years, and you admired the little ones who could barely reach the foot pedals. You thought any day, the piano could be conquered. When Michael began taking piano lessons with Miss Galen, your enthusiasm returned. But you stopped piano when you reached Junior High, and there was nobody home by then to see that you practiced most days. It was a busy time for me, having just started my job as principal in the Antelope Valley I got home late most evenings. In Junior High you took up flute and played it for a couple years until you needed braces, and could no longer work the flute. Later, in college, you picked up guitar, and then got a gift of a special guitar from Mike Connoway nephew of Billy Strayhorn, the music writer and arranger for Duke Wellington. Mr. Connoway told your Dad that as long as you were interested you could keep that guitar. Here, in this picture, I see you play with Michael, who ended up becoming a professional musician and musicologist, encouraging you to stay with music. We were glad to find the Connoway guitar among your possessions. My heart skipped a little beat when I read that Brian played the flute - like me. Brian and Michael - they grew up together and did so many wonderful things together. Their steadfast closeness continued from kindergarten into adulthood. How precious and genuine these childhood friendships are! Brian will always be in Michael's and my heart. My daughter plays the flute and my son the guitar. Though I never met your son I feel as if we would have got on well. Many thanks. This photo was taken at the Kohan's apartment one evening... just hanging out, playing music... being friends. 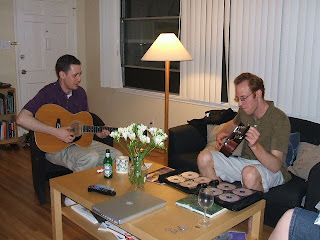 :) Mike & Brian always bonded over music... music & basketball.